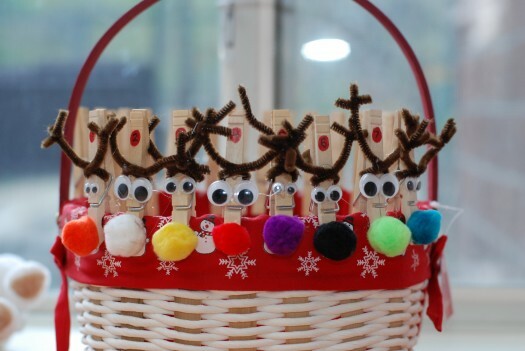 This week, I was perusing the internet in search of some new and fun fine motor activities to do with my daughter when I found this cool clothespin activity at Preschool Printables..and another one at Story Time Standouts and then I found these ADORABLE clothespin reindeer on 2 Teaching Mommies…so I decided to combine the three and make my own clothespin wheel activities with a Christmas theme! 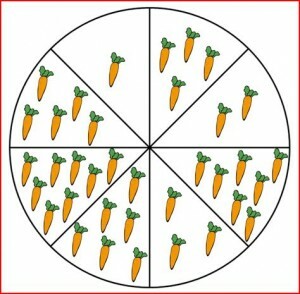 For the Reindeer counting: Have your child count the carrots in each section of the wheel and attach the corresponding clothespin number. 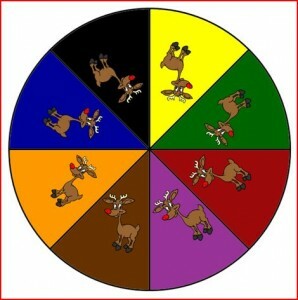 For the Reindeer Color matching: have your child match the reindeer nose color to the colors on the wheel. 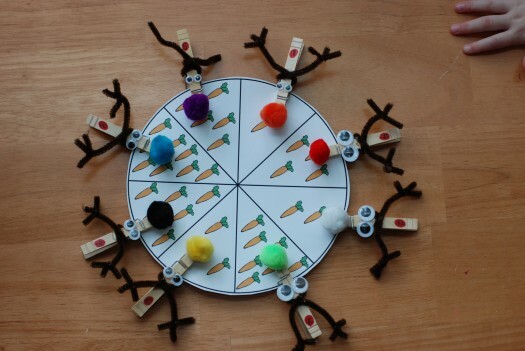 Other activity idea: Print out two sets of each wheel, cut out each individual “slice” and use them for a memory card game or a “go fish” game. To make it more difficult, instead of just asking for the objects by name, have your child describe them. 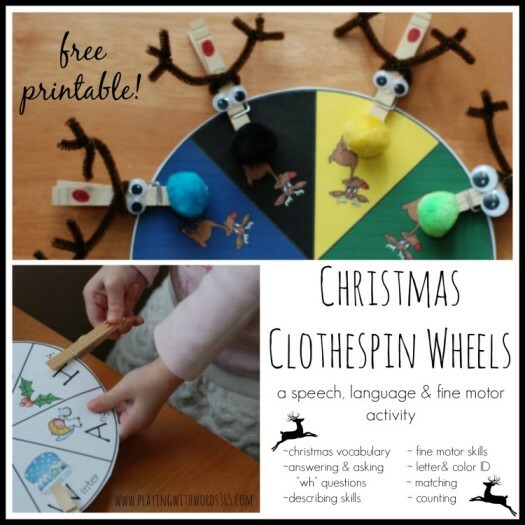 Other activity idea: To work on describing skills, you can take turns playing “I Spy” by describing the different Christmas objects on the two wheels. When the other player figures out which object it is, he/she can place the clothespin on it. We had a great time with these..I hope to do them often in the next week and a half leading up to Christmas. I could tell it was a good fine motor activity when my daughter told me her fingers were “too small to do it” (her way of saying tired/hurting) after a while! Here are our Reindeer friends! Now that the reindeer are nice and full, they are going to take a nap while we do some letter matching. Here are our letters all set up on the basket. 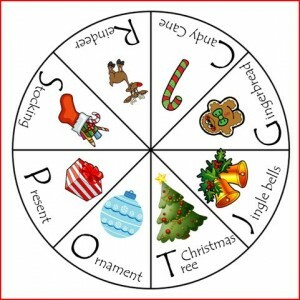 Now we will match them up while we talk all about the different Christmas words! We are learning new words today! (Like Kris Kringle…my daughter said “No mama, that’s Santa” ha ha ha). 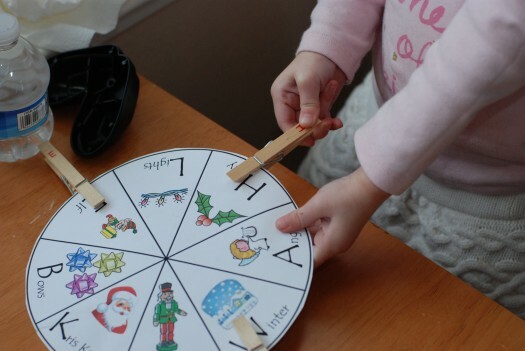 Another variation: Rather than letter ID/matching, you can print out two copies of each wheel and cut out and glue one copy of the images to a clothespin and have your child match the pictures (this is great for little ones who are not yet ready/interested in letters). To make this a language rich experience, be sure to have conversations about the pictured items. Talk about where we see it (do you have this in your home? where? ), who might have it, what we do with it, what it looks like, what it feels like, what it smells like, what it sounds like, how BIG or SMALL, etc. 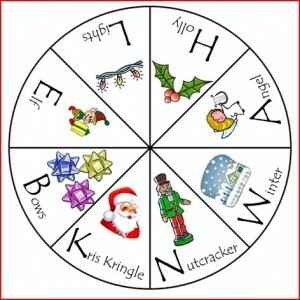 Another idea: Go for a Christmas scavenger hunt! How many of the items can you find in/around your house? 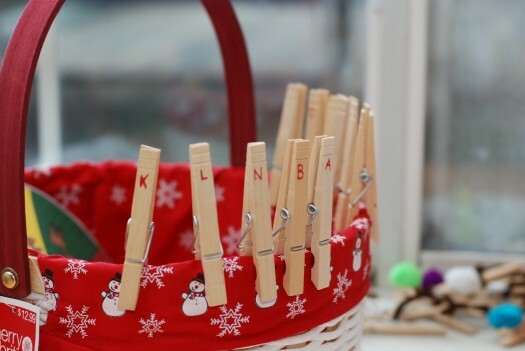 Attach a clothespin for each item you find. If you can’t find an item, where might we find it? 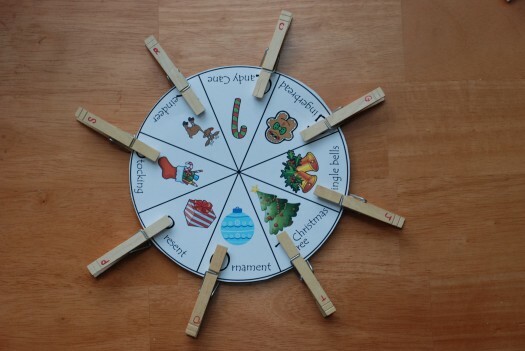 You can download the four Christmas Clothespin Wheels HERE (graphics thanks to Office Images) You will just need to get the clothespins! 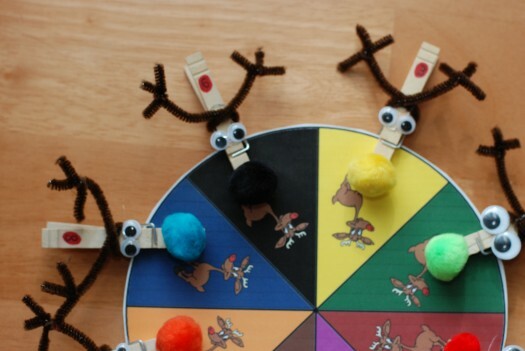 😉 (And the supplies for the little reindeer, you know you want to make them now too!). Awe thanks Jessica!! 😀 Happy Holidays! Sierra too funny…I hope you don’t get any coal!!! 😉 And thanks for the kind words! And for the PIN! 😀 Happy Holidays! Katie, just wanted to let you know I linked back to your blog in my newest post with my reindeer tot tray 🙂 Merry Christmas! Your site is a great resource of ideas and more. However, I was wondering if you can share some ideas. I am currently working with a young boy who is non-verbal but as well likes to put everything in his mouth. Is there any activities I can do with him? As well how do I get him to enjoy activities that can help his fine motor skills?